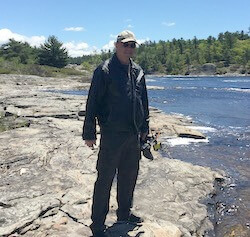 Georgian Bay Forever is working with Dr. Kevin McCann of the University of Guelph, and the Canadian Centre for DNA Barcoding to catalogue all the aquatic organisms in Georgian Bay. This will help with measuring the impact of environmental stressors like climate change and human activity such as shoreline development as well as aiding in future conservation efforts, ecosystem monitoring, forensics, and tracking invasives. All the specimens collected and identified will also contribute to the International Barcode of Life , a multi-nation effort to catalogue the world's biodiversity. Here are 2 examples from Georgian Bay's Aquatic Species Library. Did you know male bass were such protective parents? 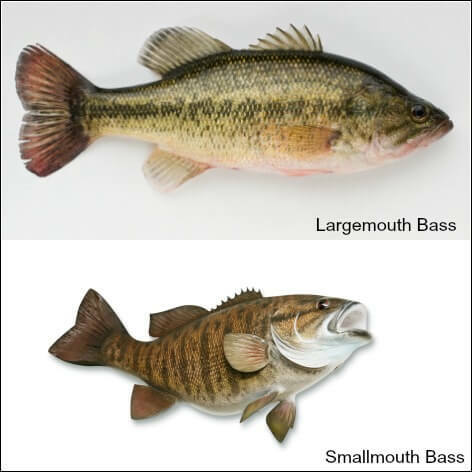 Or could you tell the difference between smallmouth and largemouth? Stripes. A largemouth bass has broad stripe running horizontally whereas a smallmouth bass has lines running vertically . Mouth extension in relation to the eye. A smallmouth's goes to the medium point of the eye generally, while a largemouth's extends beyond it. Dorsal fins. A largmouth's dorsal fin is almost 2 separate fins, with 9 or more in the front, while a smallmouth's is not divided. Scales on the cheek. A little tricky to examine, but largemouth bass have about 17 rows of scales, and a smallmouth has 10 rows. There appear to be many lovely characteristics that these two fish types generally share. See this great 2 min video shows their protective side. Bass fathers are active parents. Males make nests up to 2x their length, moving debris on sand and gravel and cobble bottoms using their mouths and tails which often get damaged but soon heal. When the males are done fashioning the nest, they look for a female so they can swim around the nest together allowing eggs and sperm to collide as they make their way down to the nest. Males guard the nest until the eggs hatch, which can take more than 4 days. For an additional 2 to 3 weeks or so, the males may continue to keep a vigilant watch until the infant bass are ready to swim out on their own and the focus for everyone turns to feeding. Are they natural to Georgian Bay? Probably - both seem generally to be described as being found in the Great Lakes watershed and the St. Lawrence River. However, there also appears to have been a fair amount of introduction of the smallmouth species in several lakes in Ontario which may have impacted Georgian Bay. Spawning and raising of hatchlings starts in May and extends to late June and early July. If you fish for bass, practice sustainable fishing such as catch and release, follow the laws and avoid spawning times and locations. To learn more about catch and release, turn to page 5 of "Walleye Woes" from the Eastern Georgian Bay Stewardship Council; and watch this video (also above) with footage and educational commentary provided by Andy Metelka. Andy Metelka is passionate about demystifying what is underneath the surface of Georgian Bay, and showing us all its beauty. His video footage and photographs really help us understand the ecosystems that we need to fight to protect. GBF truly thanks him for his love of the creatures of The Bay.